My garden this year actually hasn't done too bad. Getting lots of tomatoes (mostly little cherry and juliets) and some zucchini and squash. 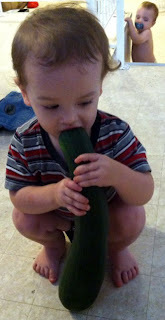 The other day I picked a zucchini that had gotten pretty big and decided to have one of the babies hold it to see how big it was compared to them. So I handed it over to Isaac and he thought it was a snack for him.